Hello all apple peoples! I saw this billboard today and I have no idea what it could mean. Somehow i doubt apple would come to sioux city, Ia. especially since they have a location in omaha ne, with his about an hour away. so if anyone knows what this could mean, I'd appreciate it. Hm that's weird. Did you take the picture? If not, its prolly shopp'd. I live in Omaha NE, btw. the Apple Store here is nice. i took the photo myself, its most definitely not Photoshopped. And i know its definitely nice.. Ive been there many times. Somehow i doubt apple would come to sioux city, Ia. especially since they have a location in omaha ne, with his about an hour away. Don't be too sure. Here in Portland, OR there are two Apple store within 10 minutes driving, and a third store about 20 minutes further. An Apple store could be coming to Sioux City. Does anyone know where to find locations of new stores? I looked on Hot News and a few other pages, but found nothing -- not even how to locate the store nearest to me. Ok, lets say i believe its a store.. heres the part that throws me. it says coming May 1st.. we drove all over hell last night tryin to unlock this mystery.. yeah, there is no anything that remotly looks like its going to be an apple store..
i don't know.. guess i'll let ya all know May 2nd. Okay, here's another possibility: No other reports of a billboard like this have come in from anywhere else. 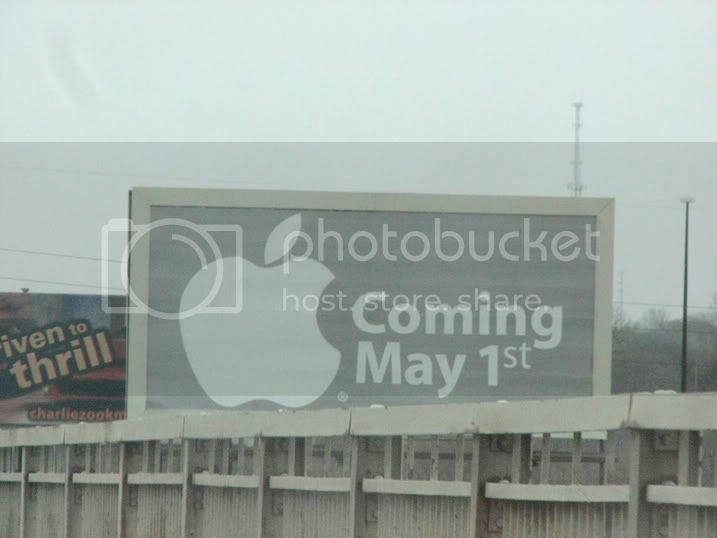 Apple simply picked Sioux City at random to start a campaign, and will post an new board somewhere every remaining day in the month of April. If no more billboards are reported my theory is kaput! The wait for a new macbook or a new mini is driving me crazy. Do we know what this billboard is all about? Please Apple do it for May...I can't wait....All the family, MacBook, iMac and Mini....(and why not this famous tablet we are all waiting to touch). I know the location of the new Apple Store in Sioux City. Do you guys really want to know now or do you want to wait until Tues. Uh... Why would we want to wait? Great first post WASHY, but do you know what an even better second post would be? Telling us. My information as of yesterday indicated that the new Apple Store is goiing to be located on Gordon Drive in a shopping center strip mall (HyVee) is there I think. Left side as you are heading out to WIT. My info suggests that it will indeed open on 1 May. I hope that the info is valid-source--relative of the new manager. I did not post the location first as I did not know who might be interested other than myself. There are a couple of empty spots on that strip mall, and the windows to one of the shops is covered with paper. Maybe that is our new Apple Store. Or maybe not. There it is.. the mystery has been solved! Why would they make a giant mystery billboard just for that? Do they actually carry Apple products, or just service Macs? from what i can tell, they sell them as well. The store didn't open today.. it said it had problems..so its opening tomarrow.. I plan on goin in, i'll get back to ya all. any of you other sioux city goers plan on checkin it out?? i heard it is going to be a service center - and yeah... why would they make a giant mystery billboard? I went. It's kind of lame. There are some computers, a small wall of pc hardware, a TV with Apple TV, and a few Apple accessories. But they said they were getting in a bunch of Apple products in a few days. And they can get basically anything from the Apple Store online.